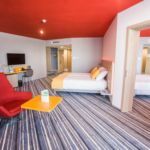 Rooms, services Park Inn by Radisson Zalakaros Resort & Spa Hotel is offering 238 comfortable rooms to guests looking for accommodation in Zalakaros. At the hotel available child-friendly services will ensure a nice holiday for the whole family. The hotel also welcomes your pet for the stay at an additional cost. Since the hotel has an own restaurant, you may also try fine local meals on the spot. If neccessary, you may leave your car at the parking place of the hotel for an extra fee. Thanks to air-conditioning being in operation in some of the rooms, you can also easily refresh yourself on warm summer days (please take a look at the information sheet of each room to see if it has air-conditioning). If you have a suitable portable device, you can connect to the Internet via a wireless network (WiFi) available at the hotel. An exact and detailed list of equipment in the rooms and of the services provided by Park Inn by Radisson Zalakaros Resort & Spa Hotel you will find on the information sheet below and on the information sheet of the individual rooms, including any applicable additional fees. Location Dísz Square is located 1.1 km, Zalakaros Bath less than 50 meters away. Catering The reservation includes half board catering at the displayed prices. Payment Your reservation may be paid by the following methods: debit/credit card, cash, bank transfer, széchenyi recreation card. Arrival, opening hours The earliest check-in time is 15:00, the latest check-out time is 12:00. The personnel of the hotel can speak with you in Hungarian, English and German languages. The rating of Park Inn by Radisson Zalakaros Resort & Spa Hotel is 9.3 from the maximum 10, 661 based on actual and valid guest ratings and reviews. "Barátságos személyzet, maximális tisztaság, finom, választékos ételek, nagyon jól éreztük magunkat ismét a szállodában. A gyógyfürdő közelsége, átjárhatóság számunkra igen fontos szempont a hotelválasztás szempontjából. Köszönjük a Hotel dolgozóinak, visszatérünk még biztosan!" "Nagyon tetszett a szálloda .Modern, tiszta , kellemes. Nagyon jól éreztük magunkat a szállodában. Teljesen megvoltunk elégedve mindennel." Based on the reviews and comments of actual guests, the services of the Park Inn by Radisson Zalakaros Resort & Spa Hotel have received a high rating of 9.3/10.